Conquer Cyber Overload may be the most important book you read this year. If you’re like me, you’re overwhelmed with media…your computer, your TV, your iPhone/Blackberry/Android are taking up a lot — if not all — of your time. It’s too much, and yet we don’t know how to — or if we want to — change it. 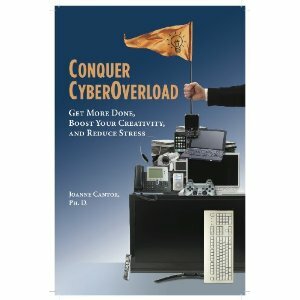 Conquer Cyber Overload is short and sweet, and most important, to the point. This isn’t an insurmountable task, after all. We’ve lived our lives entirely without these gadgets before, so it shouldn’t be too difficult to cut down on our usage. And, if cutting down means being more productive and efficient, and less stressed out, isn’t it worth it? You bet! Let’s put it this way, the very first question in the book is this one: Do you find yourself getting less done, now that you have constant access to limitless information? One of Cantor’s best suggestions is to take a break. As in, no computer, no TV, no phone, nothing but you and your work, whatever it may be. Set a time limit — or a goal that you want to achieve — with no interruptions. See how much easier it is to get things done without checking e-mail, responding to texts, answering phone calls, and so on. Imagine that! Conquer Cyber Overload is actually a book for everyone. Bloggers will definitely benefit, as will parents, individuals who work in an office, the list is really endless. It won’t be easy to make these changes, at first, but the end result is definitely worthwhile. Do yourself a favor. Take a break, and read this book. Your life will change because of it.